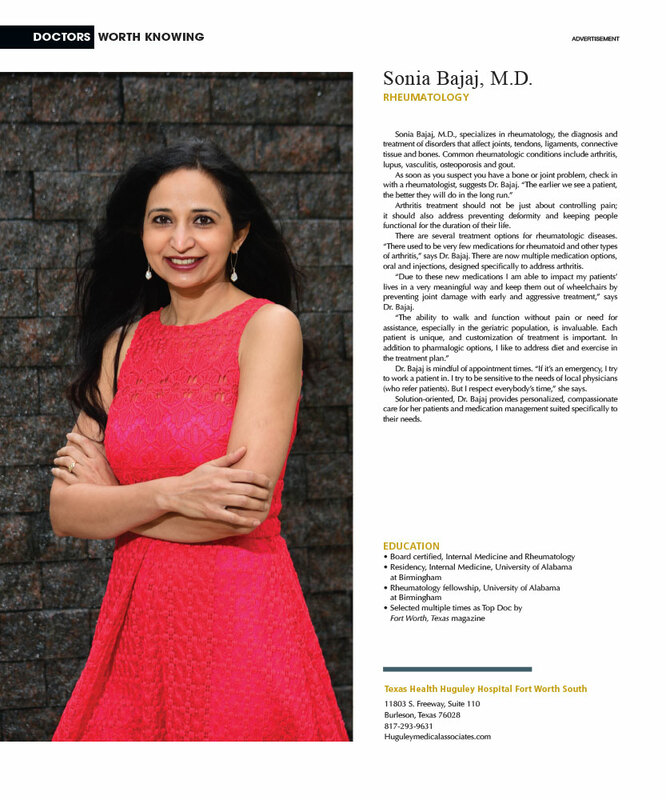 Sonia Bajaj, M.D., specializes in rheumatology, the diagnosis and treatment of disorders that affect joints, tendons, ligaments, connective tissue and bones. Common rheumatologic conditions include arthritis, lupus, vasculitis, osteoporosis and gout. Arthritis treatment should not be just about controlling pain; it should also address preventing deformity and keeping people functional for the duration of their life. There are several treatment options for rheumatologic diseases. “There used to be very few medications for rheumatoid and other types of arthritis,” says Dr. Bajaj. There are now multiple medication options, oral and injections, designed specifically to address arthritis. “Due to these new medications I am able to impact my patients’ lives in a very meaningful way and keep them out of wheelchairs by preventing joint damage with early and aggressive treatment,” says Dr. Bajaj. Dr. Bajaj is mindful of appointment times. “If it’s an emergency, I try to work a patient in. I try to be sensitive to the needs of local physicians (who refer patients). But I respect everybody’s time,” she says. Solution-oriented, Dr. Bajaj provides personalized, compassionate care for her patients and medication management suited specifically to their needs.